Everton goalkeeper Tim Howard has warned his Merseyside rival Simon Mignolet faces a "hard road back" to regain his Liverpool starting place. 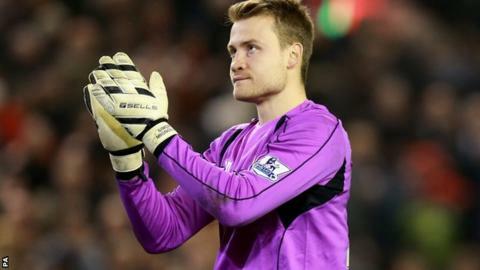 Mignolet, 26, has been dropped "indefinitely" by manager Brendan Rodgers following a poor run of form. Howard is concerned that taking the Belgium international out of the team could cause him longer-term problems. "I think it's a hard road back when you get taken out of the team. Sometimes there is no way back," said Howard. United States international Howard, 35, experienced a drop in form and time out of contention for the first-choice goalkeeper role when he played for Manchester United. "It's not easy. It's a confidence position," he added. "When you take him [Mignolet] out of the team and then bring him back, do the team and fans have confidence in him? "With goalkeepers the next mistake is only just around the corner. If you worry about that you will crumble. "I think a good goalkeeper always has to have a manager who believes in him."